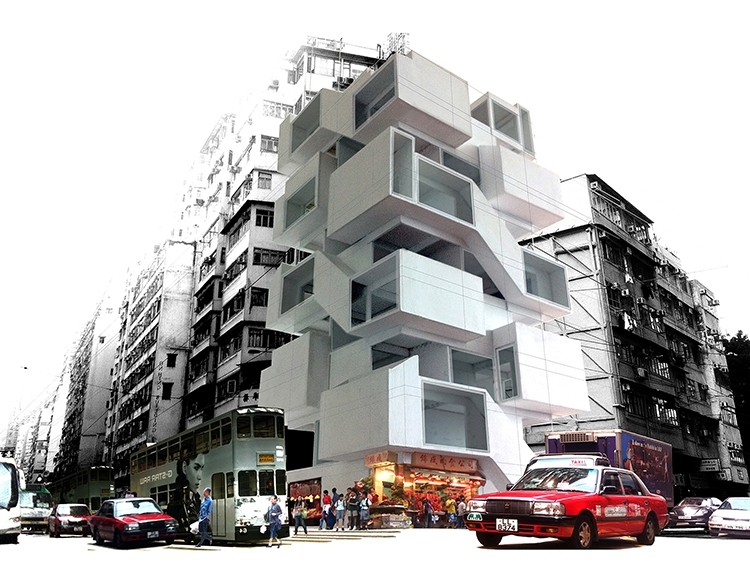 The project expands on the use of concrete precast technology in high rise construction in Hong Kong by presenting a self-supporting structure made of precast volumes of different sizes and functions. A nine-storey prototype was first developed with a team of engineers and precast experts as proof of concept to further support the development of a forty-storey high-rise, the dominant building type in Hong Kong. Most of the unit types are organized in duplexes (e.g. townhouses in the sky). Two standardized main box units serve the living and sleeping areas, complemented by two fitted cell units for bathroom and kitchen. Additionally, catalogues of precast plugins allow future residents to individualize straight from the factory the extent of their living space, based on the user’s needs and demands (i.e. number and type of windows, location of enclosure and amount of outdoor versus indoor living). Protrusions of plug-in elements provide deep shaded and naturally ventilated spaces, desirable in this sub-tropical environment. Individualization (mass production from reconfigurable formwork) and adaptability of apartment sizes overtime (from recombination of modules) offer future residents the house that is right for them straight from the factory to ultimately make up the overall identity of the Building.